An enhanced image of the Moon taken with the NOAO Mosaic CCD camera using two NSF telescopes at Kitt Peak National Observatory. The Moon is superimposed on a separate image of the sky. The start of 2012 brings with it a new year of skywatching, and lunar enthusiasts are gearing up for a stunning lineup of full moons. But, where does the tradition of full moon names come from? Full moon names date back to Native Americans of a few hundred years ago, of what is now the northern and eastern United States. To keep track of the changing seasons, these tribes gave distinctive names to each recurring full moon. Their names were applied to the entire month in which each occurred. There were some variations in the moon names, but in general, the same ones were used throughout the Algonquin tribes from New England, continuing west to Lake Superior. Feb. 7, 4:54 p.m. EST -- Full Snow Moon. Usually the heaviest snowfalls occur during this month. Hunting becomes very difficult, and so to some tribes, this was the Full Hunger Moon. Mar. 8, 4:39 a.m. EST -- Full Worm Moon. In this month, the ground softens and the earthworm casts reappear, inviting the return of the robins. The more northern tribes called this the Full Crow Moon, when the cawing of crows signals the end of winter, or the Full Crust Moon because the snow cover becomes crusted from thawing by day and freezing at night. TheFull Sap Moon, marking the time to tap maple trees, is another variation. Astrophotographer Amir H. Abolfath snapped this view of the total lunar eclipse of Dec. 10, 2011 from an observing spot in the Zagros mountains of Iran. Abolfath is a photographer with the skywatching imagery group The World At Night (TWAN). May 5, 11:35 p.m. EDT -- Full Flower Moon. Flowers are abundant everywhere at this time. May's full moon was also known as the Full Corn Planting Moon or the Milk Moon. The moon will also be at perigee just 25 minutes after turning full, at 12:00 a.m. EDT on May 6, at a distance of 221,801 miles (356,955 kilometers) from Earth. Very high ocean tides can be expected from the coincidence of perigee with the full moon. Jun. 4, 7:12 a.m. EDT -- Full Strawberry Moon. Known to every Algonquin tribe, Europeans called it the Rose Moon. A partial eclipse of the moon will be visible chiefly favoring those living around the Pacific Rim. Observers in Japan and Australia for instance, can see it at, or soon after, moonrise, while those in the western United States and western Canada see it at, or just before, moonset. At maximum, about 37 percent of the moon’s diameter will be immersed in the dark umbra shadow of the Earth. In Amman, Jordan, skywatcher Ahlam Zayed snapped this photo of the March 19 full moon, the so-called "supermoon" of 2011. Jul. 3, 2:52 p.m. EDT --Full Buck Moon. This full moon was so called because it occurs when the new antlers of buck deer push out from their foreheads in coatings of velvety fur. It was also often called the Full Thunder Moon, thunderstorms being most frequent at this time. Sometimes this is also called the Full Hay Moon. 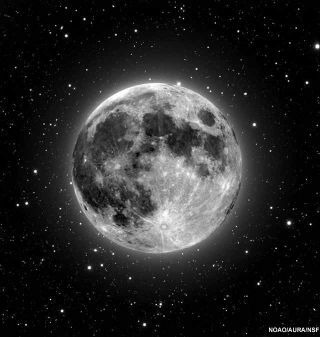 Since the moon arrives at apogee less than 13 hours later, this will also be smallest full moon of 2012. In terms of apparent size, it will appear 12 percent smaller than the full moon of Jan. 10. Aug. 1, 11:27 p.m. EDT --Full Sturgeon Moon, when this large fish of the Great Lakes and other major bodies of water, such as Lake Champlain, is most readily caught. A few tribes knew this moon as the Full Red Moon because when the moon rises, it appears reddish through sultry haze (in 2012, The Old Farmer’s Almanac gives this moniker to the full moon of Aug. 31). Other variations include the Green Corn Moon or Grain Moon. Aug. 31, 9:58 a.m. EDT --Full Corn Moon. Sometimes also called the Fruit Moon; such monikers were used for a full moon that occurs during the first week of September, so as to keep the Harvest Moon from coming too early in the calendar. This is the second time the moon turns full in a calendar month, so it is also popularly known as a "Blue Moon." Full moons occur on average each 29.53 days (the length of the synodic month), or 12.3683 times per year; so months containing two full moons occur on average every 2.72 years, or every 2 years plus 8 or 9 months. Sep. 29, 11:19 p.m. EDT --Full Harvest Moon. Traditionally, this designation goes to the full moon that occurs closest to the Autumnal (Fall) Equinox. At the peak of the harvest, farmers can work into the night by the light of this moon. Usually the full moon rises an average of 50 minutes later each night, but for the few nights around the Harvest Moon, the moon seems to rise at nearly the same time each night: just 25 to 30 minutes later across the U.S., and only 10 to 20 minutes later for much of Canada and Europe. Corn, pumpkins, squash, beans and wild rice — the chief Indian staples — are now ready for gathering. Skywatcher Phillip Jones took this photo of the full moon on March 19, 2011 from Frisco, Texas. Nov. 28, 9:46 a.m. EST --Full Beaver Moon. Now it istime to set beaver traps before the swamps freeze to ensure a supply of warm winter furs. Another interpretation suggests that the name Beaver Full Moon comes from the fact that the beavers are now active in their preparation for winter. This full moon is also called the Frosty Moon. Since the moon arrives at apogee less than six hours later, this will also be the smallest full moon of 2012. In terms of apparent size, it will appear 12 percent smaller than the full moon of May 5. There is also a penumbral lunar eclipse with this full moon; observers in the western parts of the U.S. and Canada might notice the upper part of the moon appearing slightly darker as 92 percent of the moon’s diameter becomes immersed in the fainter penumbral shadow of Earth. Dec. 28, 5:21 a.m. EST -- Full Cold Moon. December is usually considered the month that the winter cold begins to fasten its grip. It is also called the Full Long Night Moonsince nights are at their longest and darkest. The term "Long Night Moon" is a doubly appropriate name because the mid-winter night is indeed long and the moon hangs above the horizon for a long time. The mid-winter full moon takes a high trajectory across the sky because it is opposite to the low sun.